NOTE: NOIDA as an acronym means New Okhla Industrial Development Authority. Due to common parlance, this region of Gautambudhnagar is referred to as Noida. This has resulted in the New Okhla Industrial Development Authority being called Noida Authority itself. ­­“Some 15 years back, it used to be difficult to find a bride for the grooms of this village. The village folk stole cattle from nearby villages as no form of vegetation could be cultivated on these lands. The times have definitely changed here now,” Freelance Journalist reporting from NOIDA from the past 10 years, Amit Chowdhary quipped when asked about villages that were occupied by the New Okhla Industrial Development Authority (NOIDA). Barely five kilometres from the Noida City Centre metro station on the Noida-Greater Noida link road is Parthala Khanjarpur, a village exemplifying this phenomenon. The Noida authority had developed the village lands at the behest of builders who seek urbanised backdrops for developing residential colonies. Multi-storeyed residential apartments of Amarapali, Eldeco, Gaur, Unitech, Supertech, Ajnara and Aranya have emerged out of the barren lands of this village. While the acquisition has resulted in wealth being endowed on this region, the relative urbanisation of the acquired lands reflects poorly on the now reduced village areas. The National Sample Survey Office (NSSO), Ministry of Statistics and Programme Implementation released the key indicators of urban slums in India on December 24, 2013 based on the data collected from their 69th round survey. It identified slums as being a part of the urban environment, identified by the presence of features of living conditions that are undesirable viz. overcrowding, lack of hygiene and sanitation, inadequacy of drinking water, and poor construction. It is estimated that there are some 1814 slums in Uttar Pradesh alone where the average number of households per slum stands at 114. The Uttar Pradesh government had initiated the Slums Urban Development Agency (SUDA), as the name suggests, to specifically cater to the rising number of slums which accompanied urbanisation. Under normal circumstances, the villages in NOIDA would have been under the ambit of the SUDA. A village such as Parthala Khanjarpur hosts some 1000 houses, well above the minimum 20 required to be considered as a slum for the survey. According to Gram Pradhan, Raghuvar Pratap Yadav, popularly known as ‘Bhura’, the permanent accommodations in villages are a result of the compensations bailed out by the NOIDA authority. 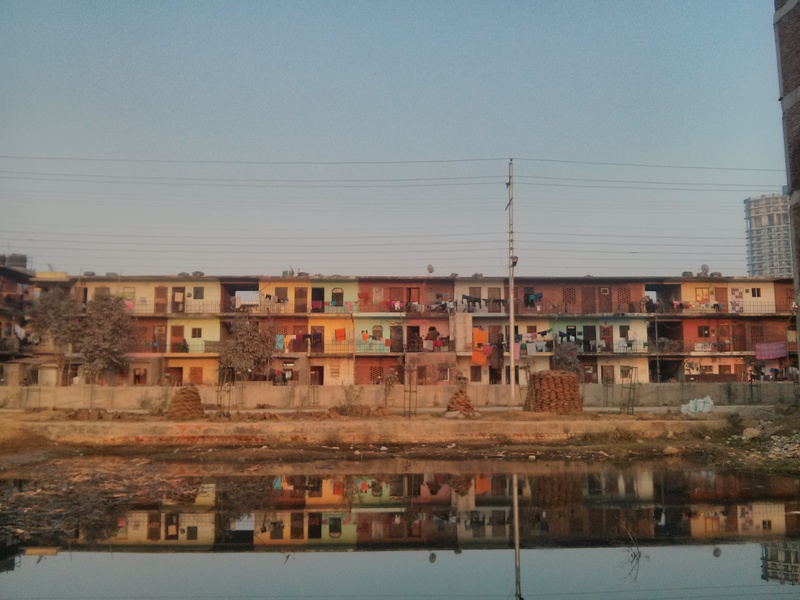 By text, a slum should emerge within an urban backdrop, but the villages in NOIDA exhibit similar traits despite being treated under rural areas. This results in them being excluded from schemes aimed at improving the condition of slums. 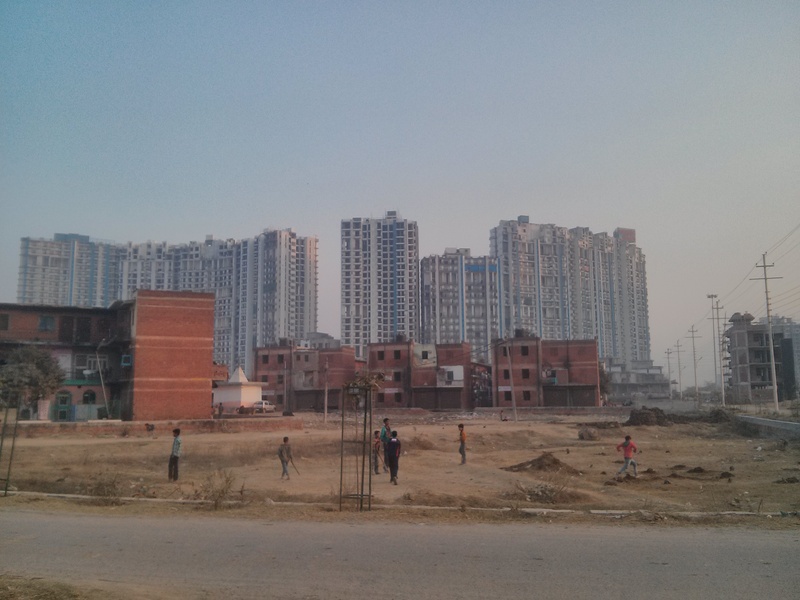 Further complicating the policy forming mechanism for their villages is the dual nature of NOIDA’s administration. All policies for improving civic amenities proposed by the Lucknow based Uttar Pradesh government need to be cleared by the National Capital Region (NCR) authority and the NOIDA authority under the UP Industrial Development Act 1976 before being implemented within the region. 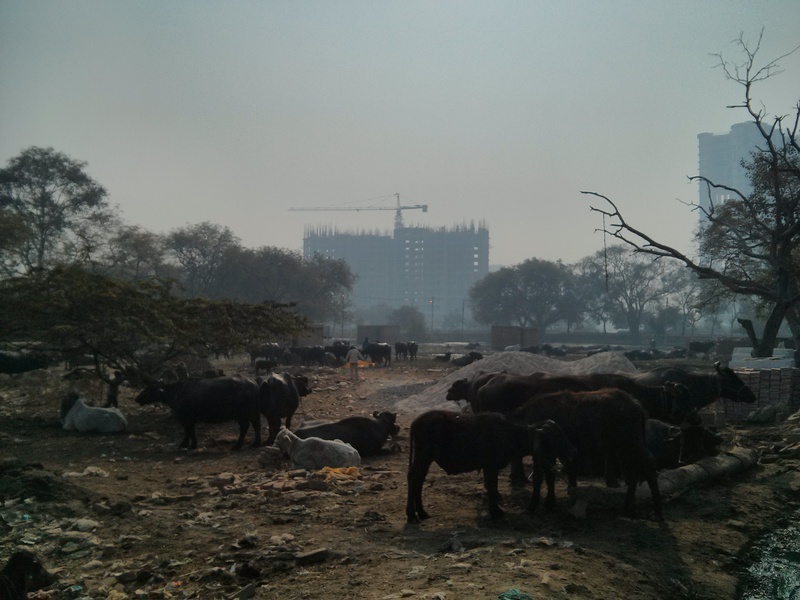 Photo 2: Buffaloes and Cows still form the backbone of this village’s economy inside the ‘urban’ Noida. The NOIDA authority recognises 31 village panchayats which span over 81 villages. As of 2002, the authority sanctioned Rs 10 crore for the development of schools, community centres, panchayat houses, provision for water supply and sewerage facilities. This budget kept steadily increasing and during the year 2010-2011 the budget was Rs 71 crore. For 2012-2013, it was Rs 170 crore. On April 27, 2013, Deputy Executive Officer, Mr Vijay Kumar Yadav sanctioned Rs 250 crore under the village development budget for the year 2013-2014. Parthala Khanjarpur’s current area can be divided into three major portions, the village, the rented accommodation complex and the market. Housing those whose lands were acquired by the urban development authority, the village population is primarily comprised of the Yadav community. The Yadavs belong to the Ahir clan and are traditionally cow/buffalo herders and milk vendors. The government of India categorises them within the Other Backward Category (OBC), making them eligible for reservations in education and government institutions. They have been dominant electorally, socially and financially in the region since they owned a majority of the land before it was acquired. Photo 3: The rented residential accommodations within the village. The village lanes and houses are not numbered. Without a well-defined address, the villagers find it difficult to provide a proof of residence in order to enable government schemes and apply for government documents. Parthala Khanjarpur also lacks a proper sewerage system which adds to the woes of residents. While Gram Pradhan, Raghuvar Pratap Yadav does claim that only a few houses are left to be connected by the sewage system, a ground check reveals a stark contrast from these claims. There are no metalled roads within the village and the average pathway is about 8 feet wide. The primary occupation within the village is still the traditional form of cattle rearing and bullock carts ferrying fodder are a common sight. The Noida authority has adopted the policy of providing commercial plots for shops in the adjoining acquired areas of villages. This has resulted in a boom in the number of farmers who have evolved as property dealers in the region. Photo 4: A young boy at his stall in the village market. 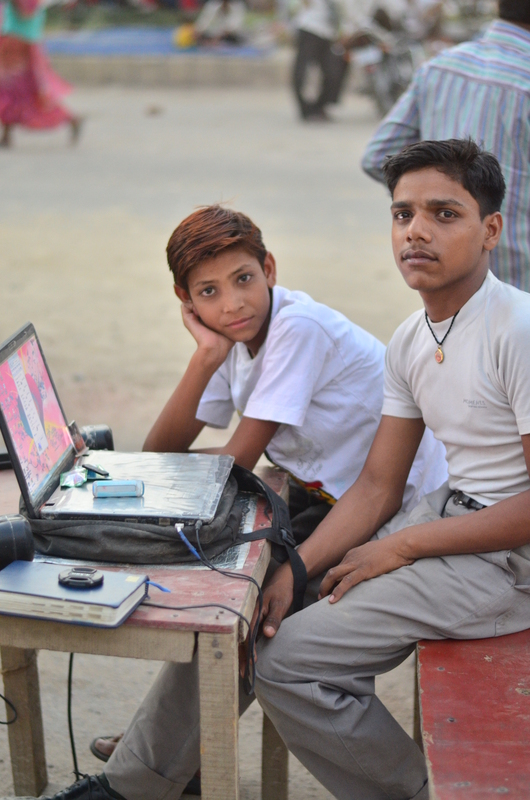 He uses his laptop to transfer pirated music and movies at nominal charges to the labourers and daily wage workers. Sources of water supply in the village are structured on economic lines. Those with adequate sources of income or with erstwhile landholdings have installed boring wells within their houses. For the less fortunate ones, the government supplies water by means of water tankers. The water supplied by the government machinery is labelled as being too saline for consumption. According to the NOIDA Master Plan 2031, it is mentioned that “ground water in NOIDA is generally hard in nature due to presence of calcium and magnesium in excessive amounts.” A news story by the Times of India in 2005 labelled the ground water as being unfit even for irrigation. The hardness in drinking water supply in some areas goes well above 2,200 per million (ppm) of total dissolved solids (TDS) against the maximum permissible of 500 ppm. Another portion of village area is a thrift shop market which has emerged to cater to the daily wage labourers working in the adjoining areas undergoing construction work. The market thrives on income of manual labourers from primarily from Bihar and Eastern Uttar Pradesh. These labours have also set up temporary settlements along the road running to the South of the village. Shopkeepers of this market set up their makeshift stalls along the road to the west of the village, the permanents shops border the perimeter of the village and are owned by the villagers. The Noida authority or any government institution should devise a more comprehensive policy to induce the modernisation it claimed Noida would reflect. An urban Noida is incomplete without uplifting its villages. Wonderfully written , you have aptly high -lighted the problems from all aspects. There is one more area which has been deveoped in parthala khanjarpur for resident purpose, some colonies with name Radhakunj.many educated people from outside UP builtup their homes and lives with their families, Ita near pusta road opposite water treatment plant. Hi Chandan , I have a query regarding Radhakunj Colony. Is it authorized for construction ? I had heard that NOIDA authority going to develop Green Corridor for which they are occupying the river basin land just mare of 2900 rs per sqm. Also some police officials are taking bribe for construction . Can you please advise us regarding the property of Radhakunj Colony ,Pusta Road? I’m bit worries related to property deal in this area.